The content of each Wilson program is based on reading research. Scientific evidence reveals that reading is the intersection of five critical components: phonemic awareness and phonics (also referred to as alphabetics), fluency, vocabulary, and comprehension. Recent scientific evidence reveals that teaching students to read requires instruction in all of these (Stuebing, Barth, Cirino, Francis, & Fletcher, 2008). In fact, they are specified as critical foundational reading skills in states’ college- and career-readiness standards, the National Reading Panel report (National Institute of Child Health and Human Development, 2000), and a review of research on adult and adolescent literacy instruction by the National Institute for Literacy (Kruidenier, MacArthur, & Wrigley, 2010). Specifically, all children should receive direct, systematic instruction in these five areas during grades K-3. Together, they form the foundation upon which higher level reading skills, critical to success in college and the work force, are built. Without the ability to fluently pull print from the page and comprehend it, students will be unable to understand complex text, one of the best predictors of college success (ACT, Inc., 2006). While addressing the general student population, the science of reading also stipulates that these same foundational skills must be taught to students and adults with reading deficits (Kruidenier et al., 2010; Lonigan & Shanahan, 2009; NICHD, 2000). A lack of foundational skills is a major cause of poor performance in struggling readers. Word-level deficiencies limit an individual’s exposure to text, which in turn impedes the person’s vocabulary development and reading comprehension (Stanovich, 1986). To overcome these deficiencies, students and adults with reading deficits require direct, systematic instruction in the foundational skills of reading. The content of each Wilson program (Wilson Reading System®, Fundations®, and Just Words®) is based on this research. Research supports direct instruction in phonemic awareness as a critical component of an effective reading curriculum (Ehri, Nunes, Willows, et al., 2001; Lonigan et al., 2009; Melby-Lervåg et al., 2012). Wilson’s approach to phonemic awareness instruction is based on research validating best practices that maximize growth in phonemic awareness skills. Research has found that, “Instruction that taught phoneme manipulation with letters helped normal developing readers and at-risk readers acquire phonemic awareness better than phonemic awareness instruction without letters.” (National Reading Panel Report, NICHD, 2000, Chapter 2-28). Furthermore, Shaywitz found that, “While phonemic awareness refers to the sounds of spoken words, it often helps to use letters to emphasize the different sounds and to facilitate transferring this skill to reading” (2003, p 178-179). Aligned with these findings, Wilson’s programs teach letters with sounds to help students learn how to manipulate and segment sounds. Phonics instruction in the Wilson programs is explicit and systematic. Students are directly taught the letter–sound correspondence in the written form of the English language. This aligns with recent research demonstrating that students in the primary grades make stronger gains when provided with direct phonics instruction as compared to incidental phonics instruction that is not clearly defined and explicitly taught (Stuebing et al., 2008). The same is also true of students with reading deficits (Mathes et al., 2005; Torgesen et al., 2001). Wilson also aligns with a synthesis of research studies demonstrating that interventions with the largest impact on students with reading disabilities or struggling readers were those that emphasized both phonics instruction and provided opportunities to apply phonics skills when reading connected text (Wanzek & Vaughn, 2007). Research consistently demonstrates fluency to be a strong predictor of reading comprehension (Adams, 1990; Breznitz, 2006; Fuchs et al., 2001; Hudson et al., 2010; Kim et al., 2012; Kim et al., 2011), so Wilson’s programs have adopted fluency instruction strategies demonstrated by research to increase the text reading fluency of primary and secondary students (Chard et al., 2002; NICHD, 2000; Wexler et al., 2008). Poor readers may have difficulty marking phrase boundaries for meaning in silent reading, and therefore it may not be easy for them to determine prosody during silent reading to support comprehension of the passage (Kleiman, Winograd, & Humphrey, 1979). Also, many students lack syntactic awareness ability to phrase appropriately when reading (Benjamin & Schwanenflugel, 2010; Mokhtari & Thompson, 2006). Since prosody helps readers chunk text into syntactically appropriate units that assist them in constructing meaning (Schreiber, 1980, 1991; Schreiber & Reid, 1980), students have opportunities to work on this skill with a passage that is controlled to have words they should be able to decode. Students are directly taught a penciling technique to chunk text into meaningful phrases, and practice fluently reading connected texts with accuracy, automaticity, and prosody. 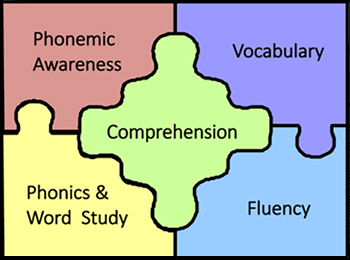 Because of the research demonstrating the difficulties struggling readers face in learning new vocabulary (Stanovich, 1986), Wilson’s programs incorporate many opportunities for students to build vocabulary and comprehension. Vocabulary is taught directly and with distributed practice. First, students are taught the meaning of select words. Selection of words is based on Beck, et al.’s research on vocabulary instruction (Beck, McKeown, & Kucan, 2002). Next, students have distributed opportunities to practice reading and use vocabulary words across different contexts, which helps foster a deeper understanding of words’ meanings and students’ memory of them (Cepeda et al., 2006; Dempster, 1988). The ultimate goal of reading is comprehension. Comprehension strategies are taught explicitly, which is particularly useful for those who struggle with comprehension (Gersten, Fuchs, Williams, & Baker, 2001). Instruction within Wilson’s programs is based on research that describes the behaviors of good and poor readers, what we know impacts one’s ability to comprehend, and research on strategies that support comprehension (Marzola, 2011). In doing so, they address both reading and listening comprehension instruction, and incorporate instruction in visualization strategies, guided close reading, and oral language instruction. Wilson’s programs incorporate instruction in spelling skills due to research demonstrating a connection in the brain between reading and spelling activities, leading researchers to believe that spelling strongly reinforces reading (James & Engelhardt, 2012). This has led to the recommendation that as children learn to read words they also learn to spell them (Shaywitz, 2003; Carreker, 2011). For students with dyslexia, it is important that they “learn to spell words with sounds and patterns that have been previously introduced for reading and practiced” (Carreker, 2011, p.282). In each program, spelling is connected to phonics instruction and is taught through explicit instruction in spelling rules, proofreading strategies to support accurate spelling, and high-frequency sight words. The ultimate goal of reading is comprehension. Research has found that the ability to decode words is a prerequisite for reading comprehension. Therefore, for students who need practice with decoding, whether ELL or not, targeted, systematic phonics instruction is essential (Torgesen et al, 2007). Furthermore, as with all students, ELL students need instruction in word learning, comprehension strategies, and academic language in order to comprehend text (Torgesen, et al., 2007). Research findings suggest that, as with native English speakers, the intervention approach for ELLs should match the learner’s area of difficulty. That is, the teacher should clearly understand a student’s area(s) of difficulty or weakness (Francis, et al., 2006). For ELL students who meet the criteria for placement in the Just Words or WRS program, the program content, design, and materials are developmentally appropriate for them. consistent links made between the visual, auditory, and kinesthetic-tactile pathways in learning to read and spell. ACT, Inc. (2006). Reading between the lines: What the ACT reveals about college readiness in reading. Iowa City, IA: Author. Beck, I.L., McKeown, M.G., & Kucan, L. (2002). Bringing words to life: Robust vocabulary instruction. New York, NH: Guilford Press. Benjamin, R. G., & Schwanenflugel, P. J. (2010). Text complexity and oral reading prosody in young readers. Reading Research Quarterly, 45(4), 388-404. Breznitz, Z. (2006). Fluency in reading: Synchronization of processes. Mahwah, NJ: Lawrence Erlbaum Associates. Carreker, S. (2011). Teaching spelling. In J.R. Birsh (Ed. ), Multisensory teaching of basic language skills (3rd ed., pp 251-291). Baltimore, MD: Paul H. Brookes Publishing Co., Inc.
Cepeda, N. J., Pashler, H., Vul, E., Wixted, J. T., & Rohrer, D. (2006). Distributed practice in verbal recall tasks: A review and quantitative synthesis. Psychological Bulletin, 132, 354-380. doi: 10.1037/0033-2909.132.3.354. Francis, D. J., Rivera, M., Lesaux, N., Kieffer, M., Rivera, H. (2006). Practical Guidelines for the Education of English Language Learners: Research-Based Recommendations for Instruction and Academic Interventions. Portsmouth, NH: RMC Research Corporation, Center on Instruction. Fuchs, L. S., Fuchs, D., Hosp, M. K., & Jenkins, J. R. (2001). Oral reading fluency as an indicator of reading competence: A theoretical, empirical, and historical analysis. Scientific Studies of Reading, 5(3), 239-256. Gersten, Fuchs, Williams, & Baker. (2001). Teaching reading comprehension strategies to students with learning disabilities: A review of research. Review of Educational Research, 71(2), 279-320. James, K.H. and Engelhardt, L. (2012). The effects of handwriting experience on functional brain development in pre-literate children. Trends in Neuroscience and Education, 1(1), 32-42. Kim, Y.-S., Wagner, R. K., & Foster, E. (2011). Relations among oral reading fluency, silent reading fluency, and reading comprehension: A latent variable study of first-grade readers. Scientific Studies of Reading, 15(4), 338-362. Kleiman, G. M., Winograd, P. N., & Humphrey, M. H. (1979). Prosody and children’s parsing of sentences (Tech. Rep. No. 123), Urbana, IL: Center for the Study of Reading, University of Illinois. Kruidenier, J. R., MacArthur, C. A., Wrigley, H. S. (2010). Adult Education Literacy Instruction: A Review of the Research. Washington DC: National Institute for Literacy. Lonigan, C. J., & Shanahan, T. (2009). Executive summary of the report of the National Early Literacy Panel. In Developing Early Literacy: Report of the National Early Literacy Panel (pp. v-xii) . Washington DC: National Institute for Literacy. Marzola, E. S. (2011). Strategies to improve reading comprehension in the multisensory classroom. In J.R. Birsh (Ed. ), Multisensory teaching of basic language skills (3rd ed., pp. 365-403). Baltimore, MD: Paul H. Brookes Publishing Co., Inc.
Mokhtari, K., & Thompson, B. (2006). How problems of reading fluency and comprehension are related to difficulties in syntactic awareness skills among fifth graders. Reading Research & Instruction, 46(1), 73-96. National Institute of Child Health & Human Development (NICHD). (2000). Report of the National Reading Panel: Teaching children to read: An evidence-based assessment of the scientific research literature on reading and its implications for reading instruction. (NIH Publication No. 004769). Washington, DC: U. S. Government Printing Office. Schreiber, P. A. (1980). On the acquistion of reading fluency. Journal of Reading Behavior, 12, 177-186. Schreiber, P. A. (1991). Understanding prosody’s role in reading acquisition. Theory Into Practice, 30, 158–164. Schreiber, P. A., & Read, C. (1980). Children’s use of phonetic cues in spelling, parsing, and—maybe—reading. Bulletin of the Orton Society, 30, 209–224. Stanovich, K. E. (1986). Matthew effects in reading: Some consequences of individual differences in the the acquisition of literacy. Reading Research Quarterly, 21(4), 360-407. Torgesen, J. K., Houston, D. D., Rissman, L. M., Decker, S. M., Roberts, G., Vaughn, S., Wexler, J., Francis, D. J., Rivera, M. O., Lesaux, N. (2007). Academic literacy instruction for adolescents: A guidance document from the Center on Instruction. Portsmouth, NH: RMC Research Corporation, Center on Instruction.